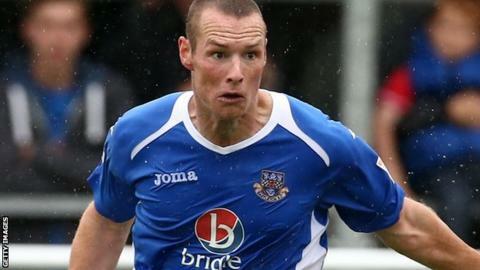 James Constable headed a stoppage-time winner to hand Eastleigh victory at home against Boreham Wood and a second National League win of the season. Danny Woodards and Ricky Shakes went close for Boreham Wood with first-half shots from the edge of the box. Eastleigh midfielder Jai Reason nearly added to his goal from the opening day of the season but dragged a shot wide. Graeme Montgomery nearly won it for Boreham Wood from distance before Constable nodded home Lee Cook's cross. Match ends, Eastleigh 1, Boreham Wood 0. Second Half ends, Eastleigh 1, Boreham Wood 0. Substitution, Boreham Wood. Junior Morias replaces Conor Clifford. Goal! Eastleigh 1, Boreham Wood 0. James Constable (Eastleigh) header from a difficult angle on the right to the bottom right corner. Assisted by Lee Cook with a cross. Attempt saved. Josh Payne (Eastleigh) right footed shot from outside the box is saved. Andy Drury (Eastleigh) wins a free kick. Attempt missed. Graeme Montgomery (Boreham Wood) left footed shot from outside the box misses to the left. Harry Crawford (Boreham Wood) wins a free kick. Substitution, Eastleigh. Lee Cook replaces Ben Strevens. Andy Drury (Eastleigh) is shown the yellow card for a bad foul. Foul by Andy Drury (Eastleigh). Offside, Boreham Wood. Harry Crawford tries a through ball, but Harry Crawford is caught offside. Hand ball by Ben Strevens (Eastleigh). Substitution, Boreham Wood. Matt Whichelow replaces Billy Clifford. Substitution, Boreham Wood. Harry Crawford replaces Jamie Lucas. Offside, Boreham Wood. Jamie Lucas tries a through ball, but Jamie Lucas is caught offside. Foul by Ben Nunn (Boreham Wood). Yemi Odubade (Eastleigh) wins a free kick. Substitution, Eastleigh. Yemi Odubade replaces Ross Lafayette. Attempt saved. Ben Strevens (Eastleigh) header from the left side of the box is saved. Assisted by Jai Reason. Foul by Graeme Montgomery (Boreham Wood).